A sampling of military ribbons. A "military salad bar" -- or a "fruit salad bar," as it is often referred to -- is not a collection of delightful snacks and vegetables. It is, in fact, an informal reference to the ribbons worn by officers and enlisted men on their dress uniforms that represent the various medals and campaigns they have received or served in. 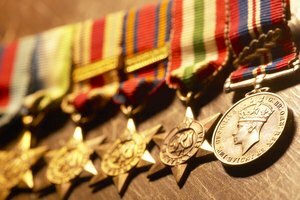 There is a very strict order of display for the "salad bar," with each ribbon and medal having its own proper place amid all the others. The following list is complete, but you may not have every ribbon mentioned. If you do not have one of the ribbons mentioned in the list, skip ahead to the next one in line that you do have. Place the honorable discharge ribbon highest on your military jacket and farthest to the left. Your honorable discharge ribbon always takes the most important place on your jacket. 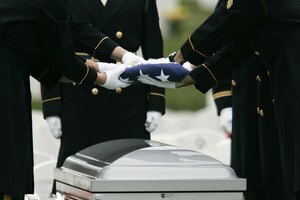 Pin the Medal of Honor ribbon immediately to the left of your honorable discharge ribbon. This is the United States' highest award, and takes the second-highest place of honor in your "salad bar." 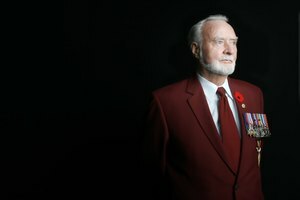 Attach any commendation or medal ribbons in the following order: Certificate of Merit, Distinguished Service Cross, Defense Distinguished Service, Distinguished Service Medal, Silver Star, Defense Superior Service, Legion of Merit, Distinguished Flying Cross, Soldier's Medal, Bronze Star, Purple Heart, Defense Meritorious Service, Meritorious Service Medal, Air Medal, Joint Service Commendation Medal and Army Achievement Medal. Begin a new row as needed; you should never have more than four ribbons in any one row, and never more than 1/8 inch between rows. Continue placing ribbons in this order: Joint Service Achievement Medal, Army Achievement Medal, Prisoner of War Medal, Good Conduct Medal, Army Reserve Components Achievement Medal, American Defense Medal, American Theater Campaign Medal, Asia Pacific Medal, European/African/Middle East Campaign Medal, World War II Victory Medal, Army of Occupation Medal, National Defense Service Medal, Korea Service Medal, Antarctica Service Medal and Armed Forces Expeditionary Medal. Ensure that the "salad bar" is centered above the breast pocket, even if that means that the top row of ribbons is off-center. Add more ribbons in the following order: Vietnam Service Medal, Southwest Asia Service, Kosovo Campaign Medal, Afghanistan Campaign Medal, Iraq Campaign Medal, Global War On Terror Expeditionary Medal, Global War On Terror Service Medal, Korea Defense Medal, Armed Forces Service Medal, Humanitarian Service, Outstanding Volunteer Service Medal, Armed Forces Reserve Medal, NCO Professional Development, Army Service Ribbon, Overseas Service Ribbon and Army Reserve Components Ribbon. 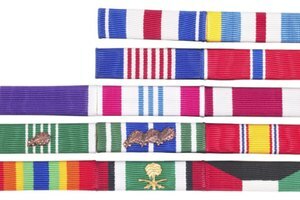 Continue adding the ribbons in order: United Nations Medal (multiple bars), United Nations Medal (two bars), NATO Medal (two bars), NATO medal (three bars), Inter-American Defense Board Medal, Multinational Force and Observers Medal, Vietnam Campaign Medal, Kuwait Liberation Medal (gold cluster), Kuwait Liberation Medal, Korea Service Medal, Presidential Unit Citation, Joint Meritorious Unit Award, Valorous Unity Award, Meritorious Unit Commendation, Army Superior Unity Award, Presidential Unit Citation (red, white and blue), Presidential Unit Citation (Japan) and the Presidential Unit Citation (gold and red bars). 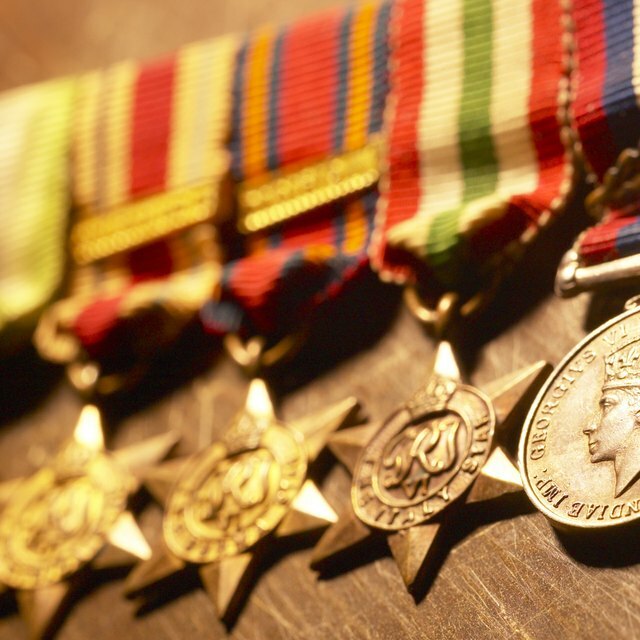 Place the last ribbons on your jacket in the following order: Vietnam Cross of Gallantry Medal, Vietnam Civil Actions Medal, Cold War Medal, Vietnam Armed Forces Honor Medal, Vietnam Meritorious Service - Army, Vietnam Wound Medal and finally the Vietnam Technical Service Medal. 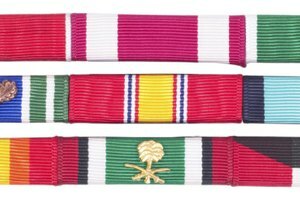 This list is a complete listing of the Army's military ribbons -- not including commendations that may be awarded by other branches of the service -- but you may not have every ribbon mentioned. If you do not have one of the ribbons mentioned in the list, skip ahead to the next one in line that you do possess. Collectors Weekly: Military Ribbons on Bar and Loose Ribbons - Military "Fruit Salad"
Benjamin, Joshua. "How to Properly Assemble a Military Salad Bar." 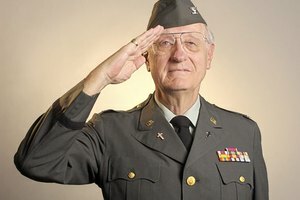 Synonym, https://classroom.synonym.com/how-to-properly-assemble-a-military-salad-bar-13583658.html. 04 October 2017.